Makoto Fujimura, recently appointed Director of Fuller's Brehm Center, is an artist, writer, and speaker who is recognized worldwide as a cultural shaper. A Presidential appointee to the National Council on the Arts from 2003-2009, Fujimura served as an international advocate for the arts, speaking with decision makers and advising governmental policies on the arts. 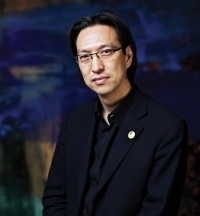 In 2014, the American Academy of Religion named Makoto Fujimura as its ’2014 Religion and the Arts’ award recipient. This award is presented annually to an artist, performer, critic, curator, or scholar who has made a significant contribution to the understanding of the relations among the arts and the religions, both for the academy and for a broader public. Previous recipients of the award include Meredith Monk, Holland Carter, Gary Snyder, Betye & Alison Saar and Bill Viola. Cosponsored by Trinity Baptist Church.